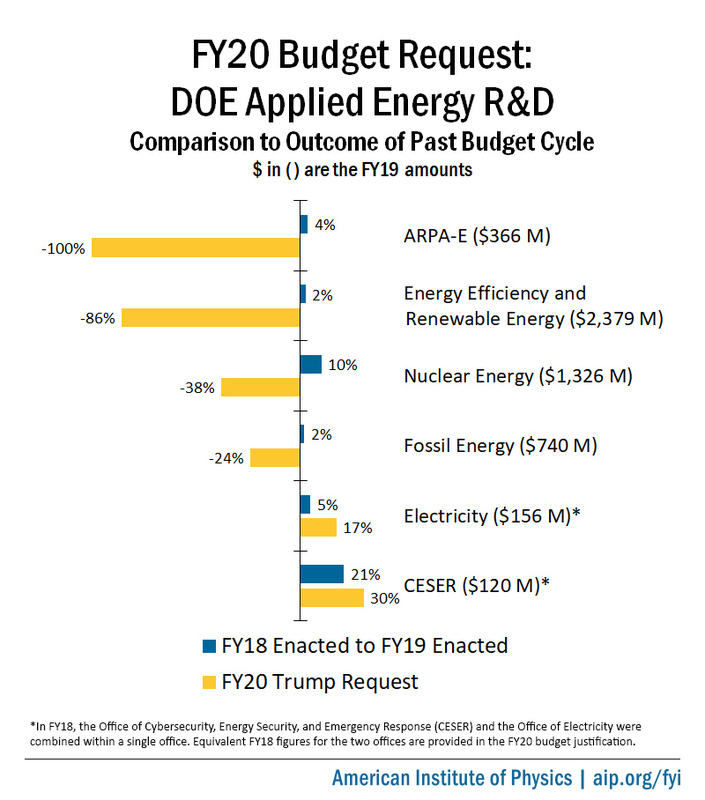 President Trump’s fiscal year 2020 budget request for the Department of Energy includes a $2 billion cut to the Office of Energy Efficiency and Renewable Energy and smaller but still sizeable cuts to nuclear and fossil energy R&D programs. The request proposes increases for electric grid resilience programs that would support new R&D efforts. 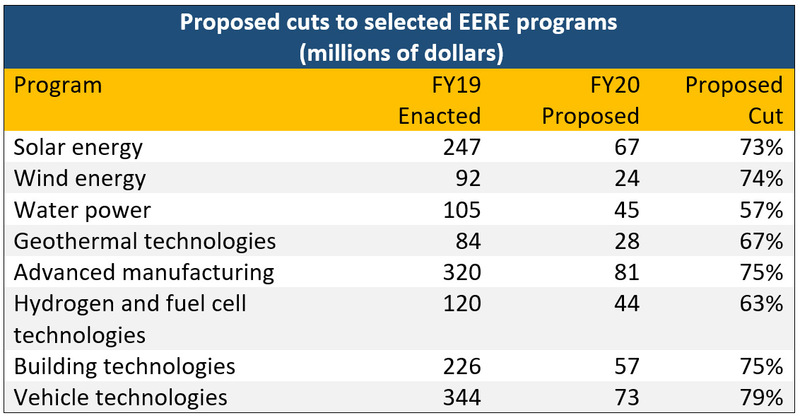 In its budget request for fiscal year 2020, the Trump administration has once again proposed deep cuts for the Department of Energy’s applied R&D programs. For the third time, it is seeking to defund the Advanced Research Projects Agency–Energy and to slash the Office of Energy Efficiency and Renewable Energy (EERE) budget to a small fraction of its current size. Nuclear and fossil energy R&D programs would also see large cuts. However, the administration is requesting increases for programs focused on the security and reliability of the nation’s electric grid. Detailed figures can be found in FYI’s Federal Science Budget Tracker. Budget justifications for all DOE offices are posted here. Over the last two years, Congress has rejected the administration’s proposed cuts to DOE’s applied energy programs, and has instead provided substantial funding increases. It appears unlikely to change course this year. To tell you the truth, I’ve often wondered why a president does a budget, because I don’t really look at the numbers. … For the last couple years they’ve cut down EERE in their budget proposal. Guess what? That doesn’t happen. We put money back into it and fill those accounts back up as Congress sees fit. In the Senate, there is talk of significantly increasing energy R&D spending. Kaptur’s counterpart there, Sen. Lamar Alexander (R-TN), is currently advocating a “Manhattan Project for Clean Energy” that would double spending on energy R&D. At a hearing on April 11, Energy and Natural Resources Committee Chair Lisa Murkowski (R-AK) said she is “all in” on Alexander’s proposal. As a detailed plan has not yet emerged, it remains unclear how any additional funding would be distributed among the applied R&D programs, ARPA–E, and the DOE Office of Science. In proposing to terminate ARPA–E, the administration also asks Congress to rescind $287 million in unobligated balances from the agency’s current budget. In addition, the administration proposes to supplement its request for EERE using $353 million in funds appropriated for prior years. Advanced Energy Storage Initiative. The administration proposes to reconfigure DOE’s cross-cutting Beyond Batteries Initiative as the “Advanced Energy Storage Initiative” and to allocate $158 million to it. The initiative encompasses R&D in batteries, pumped storage, controllable loads, distributed energy resource management, and microgrids, among other areas. EERE would contribute $105 million to the initiative. National Wind Technology Center. 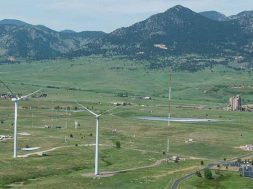 The administration proposes to expand the National Wind Technology Center campus of the National Renewable Energy Laboratory into a “fully integrated, large-scale experimental research platform that includes building an Enhanced Grid/Energy Systems Control Center and a High-Speed Data Link.” The expansion, which includes investment in a Beyond Megawatt Scale Extreme Fast Charging Station, aims to provide means to test technologies supported under the Advanced Energy Storage Initiative. 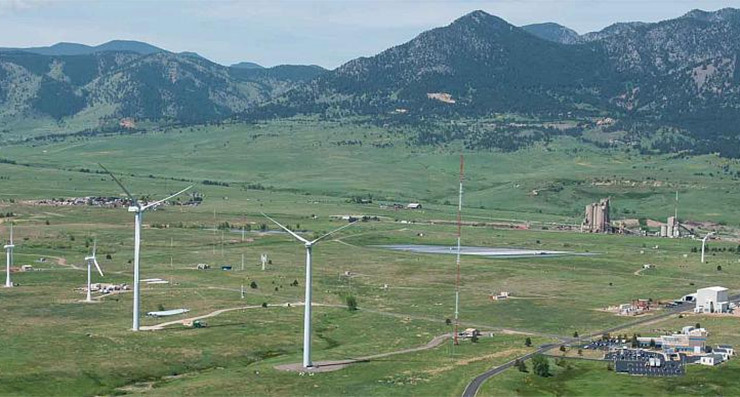 Although the administration proposes extensive cuts to the EERE budget, it also seeks to expand the capabilities of the National Wind Technology Center near Boulder, Colorado. The budget for the Office of Nuclear Energy would drop 38 percent under the administration’s proposal to $824 million, returning the office to about its fiscal year 2015 budget level. The request does, however, seek increases for certain programs that aim to facilitate the development and commercialization of “advanced” nuclear reactors. Versatile Test Reactor (VTR). The administration proposes increasing funding for the VTR from $65 million to $100 million as the project proceeds with work on its conceptual design. DOE provided initial approval for VTR earlier this year and Congress has expressed support for the project through the Nuclear Energy Innovation Capabilities Act. The reactor is intended to provide a U.S.-based capability for irradiating fuels and components intended for use in certain kinds of advanced reactors. The VTR project leader has said he anticipates the reactor will cost about $3.5 billion to build, though internal DOE documents suggest the price tag could be between $3.9 billion and $6 billion. An official cost estimate has not yet been completed. High assay low enriched uranium (HALEU). The administration proposes to increase funding for HALEU production from $30 million to $40 million. HALEU is uranium that is enriched to contain between 5 percent and 20 percent uranium-235 by weight and is required for certain advanced reactor designs. Earlier this year, DOE contracted with Centrus to demonstrate HALEU production capabilities. Currently, there is no U.S.-based capacity for commercial HALEU production. The budget justification notes the demonstration project will last for three years and the total federal contribution will not exceed $115 million. Transformational Challenge Reactor. Funding for the Transformational Challenge Reactor project at Oak Ridge National Laboratory is set to ramp down from $30 million to about $23 million. The project entails the application of additive manufacturing techniques to the fabrication of a small-scale reactor to demonstrate how such methods could be used to simplify reactor construction and licensing. Modeling and simulation. For the third year in a row, the administration proposes to terminate the Energy Innovation Hub for Modeling and Simulation, which has an annual budget of about $28 million. This year, though, the justification notes the hub is about to complete its second and final five-year performance period. A separate account for advanced modeling and simulation would decrease slightly to $30 million under the request. Yucca Mountain. Between DOE and the Nuclear Regulatory Commission, the administration proposes $155 million to resume work toward licensing the commercial nuclear waste repository at Yucca Mountain in Nevada and to support an interim storage program. However, spurred by the Nevada delegation, Congress has consistently refused to fund the project. The administration proposes to cut funding for the Office of Fossil Energy’s R&D programs by 24 percent to $562 million. Coal FIRST initiative. The administration proposes increasing the Power Generation Efficiency program from $49 million to $145 million. The boost would accommodate $70 million for new competitive funding opportunities through the Coal FIRST initiative announced late last year. The initiative, which issued its first call for proposals for cost-shared R&D projects today, supports efforts contributing to the construction of high-efficiency, small-scale coal-fired power plants capable of more flexible operations than current plants. Carbon capture, sequestration, and utilization. The administration proposes to cut the combined budgets for carbon capture, sequestration, and utilization from $199 million to $69 million. The administration proposes increasing funding for the recently established Office of Cybersecurity, Energy Security, and Emergency Response by 30 percent to $157 million. The administration proposes increasing funding for the Office of Electricity by 17 percent to $183 million.